The Salas Higuita siblings, Yoreli, Luisa, and Oskar, grew up in side-by-side-by-side rooms that each open onto a portico stretching the length of their small, L-shaped home. The house, along with a garden and a coffee washing station, sits on a small run midway up the fast rise of a mountain in the Cordillera Occidental, the western range of the Andes in Colombia. All around the house, and for a hundred meters above and below it, the mountain is covered in thousands of coffee trees. The siblings have worked this one-hectare farm since they were young children. While their father does some agriculture work, his main job is in construction; it’s their mother, Silvia, who runs the farm. She’s built it from a plot with 2,500 trees to one with 16,000, a decent-sized operation in Giraldo, a municipality in the Antioquia Department. Until eight years ago, Silvia was strictly a commodity grower like most every farmer in the area. Then she slowly began to improve her practices—better pruning, better input management, and, especially, better picking—and began to sell a portion of her crop as specialty coffee. This year she won the Antioquia Best Cup competition, a sort of regional Cup of Excellence. Her lot went for $31.50 per pound. The siblings were part of this, even though Yoreli and Luisa were in college. When Yoreli, a soft-spoken, self-possessed twenty-two-year-old, would come home from university, she would put her agronomy studies to work. 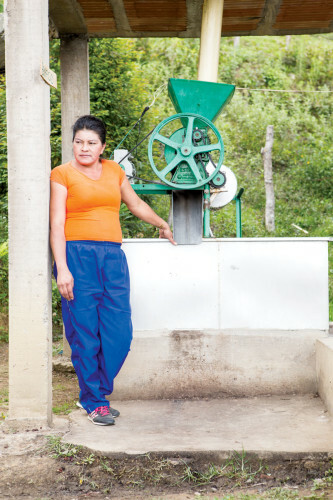 She calibrated their pulping machines and directed her dad as he built a drying bed. She’s fought with him to wear his protective gear when he sprays, which he won’t do, and she’s pleaded with her mother that using so much fertilizer is a waste, but her mother brushes away the advice. Twenty-year-old Luisa recently finished her major in environmental sciences. She persuaded her dad, likely through a barrage of arguments fired with impossible-to-interrupt rapidity, not to chop down a stand of trees along a creek because of their benefits to the farm. She’s made dealing with their mill’s pulp, and its nasty environmental effects, a major project. Oskar, at seventeen, is headed to college and may study accounting, which both his sisters expect will be useful to their mother, who only finished primary school. The siblings relate to the farm almost as a person, like an elder they are bound to and must care for. Luisa says, “Coffee gave my mother recognition, and it’s because of coffee that we were able to study. We need to honor the coffee.” Like many children of coffee farmers, the Salas Higuita siblings feel a duty to their farm. And like many children of coffee farmers, they will probably never become farmers. Campers sort coffee at the processing station. Coffee farming, for all its beauty and romance, is brutal work. The Salas Higuitas’ farm lies at the end of a twenty-minute hike up a donkey-trail that starts at the narrow dirt road winding along the mountain. The farm is planted into raw mountainside, with no terracing at all. There are narrow, horizontal paths scattered on the mountain, but to get into the trees pickers must clamber between steep rows and columns to fill their baskets with coffee cherries. Then they have to haul them out. While the vegetation is thick enough that a tumble would stop quickly, there are spots where just a one-row fall could end in a bone-breaking collision into a tree. Less avoidable was this year’s C-market plummet. While the Salas Higuita family reaped a massive windfall this year thanks to their winning lot, most of their coffee still goes for commodity prices. That’s how it is for Colombian coffee farmers. The combination of the labor and the uncertainty of prices drives many children of farmers away from the fields. 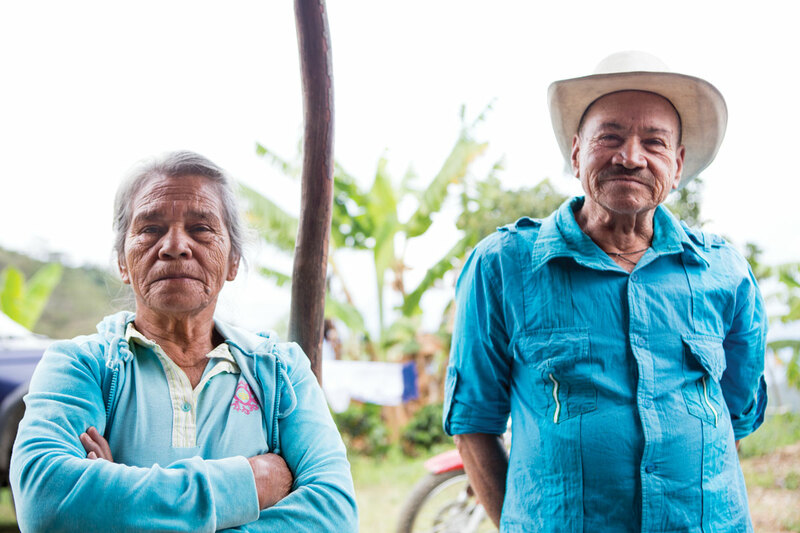 Silvia would enjoy seeing her children continue farming, but she doesn’t insist they do. If it was up to their father, a man who only made it through third grade, Yoreli, Luisa, and Oskar would never work on the farm again. When Jenny Velasquez was young, her mother would ask her if she wanted to wash dishes or pick coffee. She always chose the fields. Now she’s the head of AOSC (Antioquia: Origin of Specialty Coffee), a massive, three-year-old project intended to strengthen the department’s coffee industry. Antioquia’s government believes that relying on commodity coffee doesn’t cut it, and all of their efforts aim to encourage farmers to produce specialty-grade coffee. 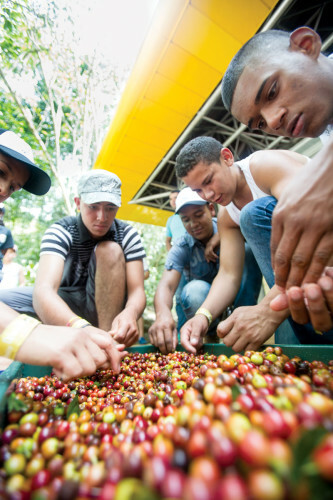 Among programs as diverse as educating farmers, building a local market for coffee, and creating the Antioquia Best Cup competition, a major task for Velasquez is keeping young people in farming. On an outdoor stage in front of more than 1,000 young people from coffee farms across Antioquia, Velasquez details the importance of coffee to the department and to the country. She exhorts them to stay on their farms. She tells them, “This is your duty. You have a responsibility to carry on.” Some in the crowd are farmers but most are the children of farmers, ranging in age from late teens to mid-twenties. They’ve gathered for a three-day camp at a waterpark in San Jerónimo, a lush and muggy resort-filled valley just up the road from Medellín, Colombia’s second-largest city. Some of the campers traveled an entire day from their farms to get here, and it’s not the first time they’ve made the trip. All of these students attended previous camps that covered basic elements of coffee processing and the supply chain. This is an advanced course that Velasquez hopes will give them the skills to carry on. Yoreli, Luisa, and Oskar are all here. Coffee farming in Colombia faces an aging grower population, threats from climate change, and competition from an economy that has doubled since the mid-nineties. 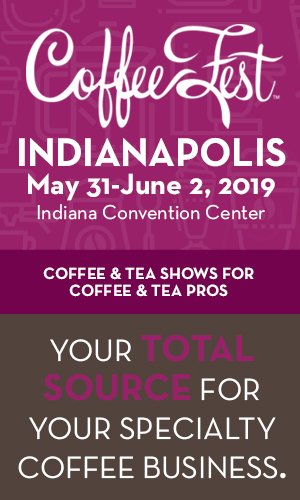 The camp offers participants courses on processing, roasting, cupping, and glimpses into the modern supply chain, but there’s really only one message: if you’re going to make it as a farmer you need to know more than your parents or grandparents did. This message of sophistication is pushed at every step. The camp is branded better than most tech conventions. Every station for the multi-hour courses has its own logo, and the teachers, most of them professionals in their thirties, wear black T-shirts emblazoned with the Antioquia: Origin of Specialty Coffee logo (an organization whose name is also a tagline) and stamped with the camp’s name, “Nueva Generación Cafetera” (new coffee-grower generation). Every teacher works for either the Colombian Coffee Growers Federation (better known as the FNC), the government of Antioquia, or SENA, a major research organization, and they bring a TED-style energy to their lectures and demonstrations. What they’re teaching is beyond what the average Colombian coffee grower has ever learned. Across the globe, few growers have ever tasted their own coffees. Most have never tasted specialty beans or drunk an espresso. At the camp’s roasting station, the campers learn to sample roast. At the processing station, the campers learn about different honey process methods. They learn how to steam milk and pull an espresso with certified barista trainers. At the cupping station, Yoreli is with a group of forty campers going through a cupping of four coffees, all of them very un-Colombian natural- and honey-processed coffees. At a previous camp, the cupping included three specialty coffees and a local commodity coffee. It was the first time Yoreli had cupped or compared specialty and commodity coffee, and she saw the value of both cupping and specialty beans immediately. Silvia Higuita stands at her washing station. 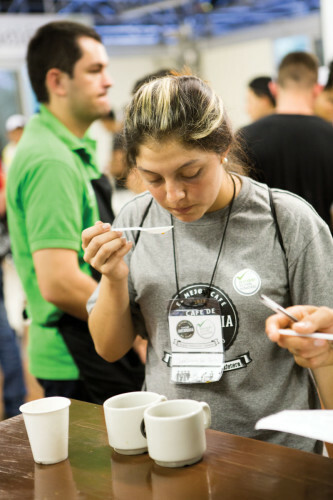 Her coffee won this year’s Antioquia Best Cup competition. Going around the table with her spoon and scoring sheet, she’s focused and serious. Most of the students are. These cups hold flavors she’s never tasted before and she wants to grab hold of as many as she can. In part, she wants to bring her mother this knowledge. 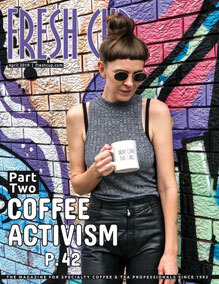 She’ll be able to explain how different processes give coffees characteristics beyond their method—the FNC-encouraged washed process—and how those unique flavors might bring in more money. She’s also locked in because since finishing her agronomy degree Yoreli has wanted to become an FNC extension agent. To do that, she needs to know cupping, know the processing methods that created these coffees (the same being taught at the processing station); she needs to know all the things these teachers do. This camp has introduced her to an entire industry that for most farmers in Colombia, and across the world, is an obscure concept they only approach when selling their coffee. Velasquez hopes that by showing campers the length of the supply chain and explaining the values that drive its different parts, they can better understand how to make more money in coffee. If a farmer sees his income as dependent wholly on a mysterious and capricious price posted at a buying station, if the farmer doesn’t know what specialty means or the premiums it can bring, then that farmer might head to a city where there is more lucrative and much less strenuous work. If coffee farmers leave, she believes, the department’s rural economy will crater. The thirty-thousand-foot view of coffee farming in Colombia faces an aging grower population, threats from climate change, and competition from an economy that has doubled since the mid-nineties, when the country was an economic and travel no-go of narco and FARC violence. Colombia’s GDP per capita, when adjusted for inflation, went from $3,000 in 1990 to $7,800 in 2013. Colombia’s coffee production hasn’t changed much, on average, since then. Neither have coffee prices. While they’ve blasted up and down over that time, mean commodity coffee prices since 1990 have been stuck at about $1.30 per pound, which is where they are now. So in real dollars, farmers are making less per pound today than at almost any point over the last twenty-five years. Luisa Salas Higuita cupping at the camp. The FNC has enviable data on the farmers within its purview, which includes nearly everyone with a coffee tree in the country (they know the number of trees, too). The average age of a Colombian coffee farmer is fifty-five. It’s fifty-seven in Antioquia. Those numbers are invariably cited as being troubling. While it’s not presented in this apocalyptic of terms, the fear, ultimately, is that coffee farmers are dying out and that a major engine of the country’s economy, one that produces thirty-five percent off all work in the countryside, will diminish if young people don’t take up farming. Going to the satellite view of this issue, it’s clear this isn’t a problem specific to Colombia. Numbers like the FNC’s aren’t available in most countries, but across the globe there’s a sense that the average coffee farmer is getting older and that it’s because no one is picking up the profession. A study by a team of researchers at Kisii University in Kenya canvassed Kisii County and interviewed 227 of the region’s 900 farmers, a decent number for analysis. The average age of the farmers was fifty-seven. The average life expectancy for Kenyans is sixty-one. The meaning of this number, like the FNC’s fifty-five, is limited. It’s a single data point—farmers are x age—so it doesn’t tell us if farmers are getting older. Requests to multiple national and international research organizations turned up no data that plotted the average age of farmers over time. We don’t know that farmers are getting older; but the anecdotal evidence—and the feeling that they are—is strong. 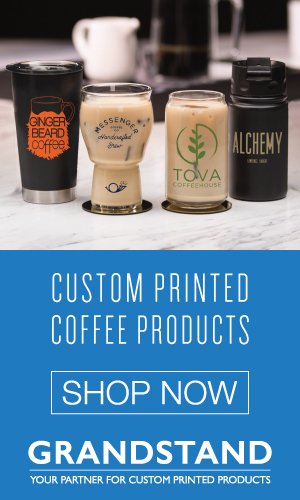 Really, though, this isn’t even a coffee problem. The world’s countryside has steadily emptied since at least the Industrial Revolution. The rural–urban migration of people in nearly every country has been the defining attribute of modernity. The US went from majority-rural to majority-urban at the beginning of the twentieth century. The world tipped the balance sometime in the last decade, with China shifting about the same time. According to the UN, Colombia’s population flipped around 1965, and is now about seventy-five percent urban. The number of people living in rural areas has barely budged since then, but the amount of land devoted to coffee has fallen, as has the size of individual farms. If a coffee-farming family succeeds in raising more than one farmer, what happens most often is the farm is split, leaving the next generation smaller plots to work. Farmers who can’t cut it head to the cities, but the land they leave behind often isn’t sold (smallholders, notoriously, can’t get loans) and unless a neighbor can lease it, the farm goes idle. Diocelina, sixty-eight, and Alfredo de Jesus Lopez, seventy, farm coffee on a plot down the road from the Salas Higuitas. But let’s get back on the ground in Antioquia, back to Giraldo where the Salas Higuitas’ farm lies and go down the road that winds along the mountain to the farm of Alfredo and Diocelina de Jesus López. The couple, like their neighbors, grows caturra and castillo on the steep slopes, and their coffees have won multiple competitions. They even raised a farmer who raised a farmer. The father, son, and grandson contain the heritage and continuity that many hold as the ideal and appeal of farming. But the farm hasn’t been passed from one generation to another, at least not yet. Alfredo is still farming his plot at the age of seventy. As he walks between the trees and up the hillside, he doesn’t move like an old man, doesn’t interact with visitors like someone prepared for dotage. Just a year ago his coffee placed high enough in the Antioquia Best Cup competition that he won a covered drying bed he wants to put to work. It’s likely he’s farming because he wants to, but he’s also farming because he and his wife have no other way to support themselves. Savings are hard to maintain as a coffee farmer and few Colombian farmers ever pay into social security. That leaves family support or working, and working means keeping a new generation from accessing the farm. On the last day of the camp, an instructor tells Luisa to head to the cupping station. Like Yoreli, she’s learned a lot from her previous experiences cupping. What she doesn’t know is that a covert goal of the camp is to identify talent and that she’s been tapped as a potential intern with AOSC’s cupping panel. Instructors have discussed career plans with both Yoreli and Luisa, certainly a mark of their smarts and education, though it’s also helpful to be the children of a farmer whose coffee set a price record in a competition. 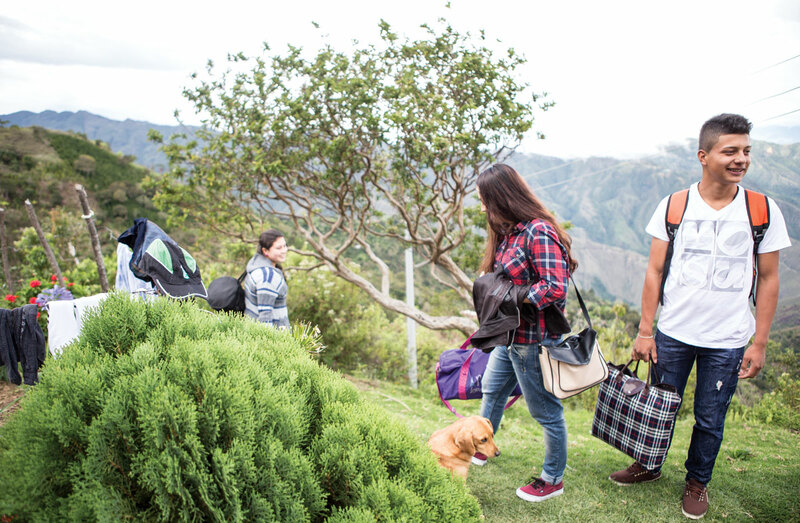 Yoreli, Luisa, and Oskar Salas Higuitas on their way to the camp. The Salas Higuita siblings may not be typical campers. They are known by the staff and they’re pulled aside to talk with industry members from other countries. They’re stand-outs. But they are also typical of the problem facing coffee. These are three well-educated, engaged, charismatic young people, but will they be coffee farmers? The camp (which only exists because Antioquia and Colombia have the financial wherewithal to fund and staff it, something few countries do) has shown a path that might lead to a better livelihood as a farmer, but it’s also shown that working in coffee can mean much more than farming. Campers talk about careers as extension agents, baristas, roasters, café owners, and co-op managers, but few say they want to be farmers. Yoreli wants to become an extension agent, and she will if she isn’t hired by an exporter first. Not long after the camp, Luisa began the internship as a cupper for AOSC. From the camps, Oskar knows that modern coffee farming requires a level of education that might only be available at a university, but he’s seventeen and could study anything. Their parents are still decades from retirement. They grow the types of coffee that allow them to improve their farm, creating a positive cycle of improvement and higher payouts. By the time they retire or can no longer farm, maybe their plot will allow one or more of the siblings to prosper there. 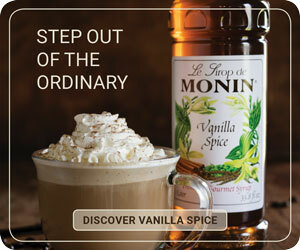 Or maybe their family’s award-winning coffee will whither as the siblings thrive away from the farm.